Fan-favorite director Isaac Florentine sure seems like he was having fun directing this one. He playfully reworks some classic Western (and especially Spaghetti Western) tropes, themes, and, for lack of a better word, cliches, and serves them up in his own, inimitable style. In other words, it’s “SWOOSH”-ing sound effects in the old west. It’s all pretty tongue-in-cheek and relatively upbeat - Florentine’s tribute to the movies he obviously loves and grew up with. Sure, as moviegoers we’ve seen this plot countless times before, from Desert Heat (1999), to The Final Alliance (1990), to, well, just about anything you can name dating back through the history of cinema. But that’s not the point. Florentine has transposed modern-day fighting skills over an old west setting, and we thought that was pretty cool. You get to see Olivier Gruner as a cowboy. That alone is worth a look, and the concept of ‘Western Kickboxing’ is just so nutty, you have to love it. The music by Kevin Kiner is an unashamed and unabashed Spaghetti Western...well...bonanza, complete with Edda Dell’Orso-style vocals. It really helps things along. But before you get too excited, there are, of course, some drawbacks. A lot of times in the movies we’ve seen, there’s no one, clearly delineated baddie. Here, there are too many! You’ve got Von Trotta, Benedict, Mitchum, and any number of fighters in the Punchfighting ring (yeah, the Tough Man competition is Punchfighting. Old West Punchfighting.) Ermey is uncredited, Ashley Laurence doesn’t really do anything at all in the second half, Singer’s character isn’t really set up as well as he could have been, and was James Brolin even in this? His screen time is so minuscule, it’s barely a cameo. And, as usual, at times the movie drags a bit. But, as a display for stunts and fights, which we assume is the main point, it certainly succeeds, and we appreciated the offbeat angle of it all. Somehow, Ian Ziering looks younger here than he does on 90210 (though to be fair, on that show the male leads were 39-year-old high school students), and he even does some light Ziering-Fu. Clearly this is Ian (pronounced eye-an, of course), at his best. Donald Gibb brightens things up and brings to mind the Bloodsport (1988) parallels, and, in a rare treat, Ashley Laurence says “Get off my land” instead of a cantankerous old man. So that was nice. While PM was the production company, the movie was released on VHS in the U.S. on A-Pix with the undistinguished title The Fighter. 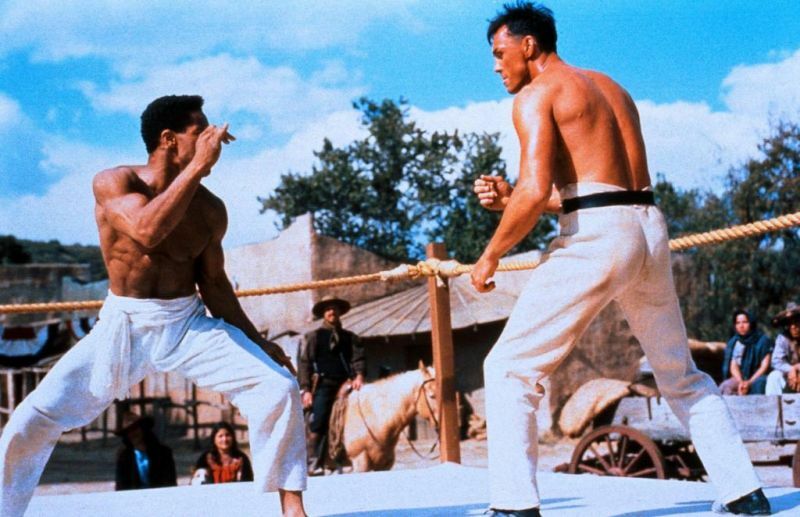 For a reasonably enjoyable homage to Spaghetti Westerns featuring some B-movie names and some notable moments and ideas, Savate comes through. This is one of my favourite punchfighters. Great setting with a great director. One of Gruner's best. Totally agree. This is his best work.